June 7, 2014 – Today was the day of ceremonies for the foundation. I would like to write about the Abbaye Ardenne ceremony. This was a rather profound ceremony for me. It was by far the most intimate of the three and the most locals also came out for it. 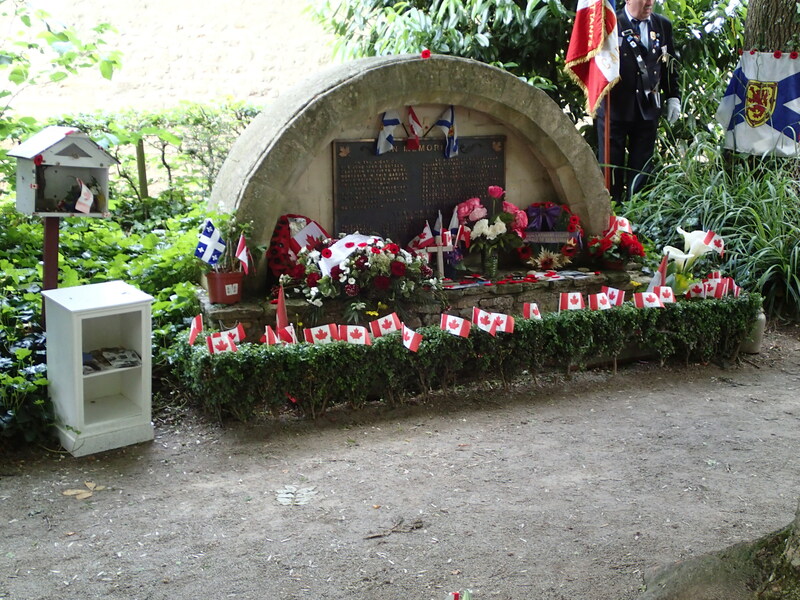 In this ceremony, the 20 Canadian soldiers from the Nova Scotia Highlanders and the Royal Winnipeg Rifles that were murdered by the Germans at the Abbaye Ardenne are remembered and commemorated. As Col. Dave Patterson read the names of the Canadians and their ages, we placed maple leafs on the monument to these murdered Canadians. I was the first student up and placed two leaves on the monument. Hearing all the names and ages, mostly in their early 20s, I cannot help reflect on what I was doing at that age and realize that these young men were doing extraordinary things in extraordinary times. This story of their capture and execution, one by one, is all the more heart-wrenching because they were shot in the back of the head and at the base of the neck. This story and ceremony reminds me also that while war is sometimes necessary, it can and does bring out barbaric sides in people and this is a telling example of that.